There are many kinds of marigolds, with yellow and orange colors and various sizes from an inch to about 3 feet high. Even the smell varies depending on the type and the place of growth. In Japan, marigold is called "Howsenka". Japanese use it for garden decoration, or as an ornamental use or Ikebana. You can also use the flower as a tea. The seeds and leaves are not only edible, but did you know that these are also used for medicinal purposes not only by traditional healers but also by modern medical groups and drug companies? You can find marigolds anywhere in the world, because it grows easily, blooms reliably throughout summer, and have few insect and disease problems. In Hong Kong, Korea and Japan, I used to drink marigold flower tea to soothe indigestion. Leaves and seeds are used to treat practically everything from insomnia to stomach cramps and cancer diseases. According to an ancient Chinese medical book of botanical herbs, marigold was one of the top leading plants which medicinal properties can be extracted. 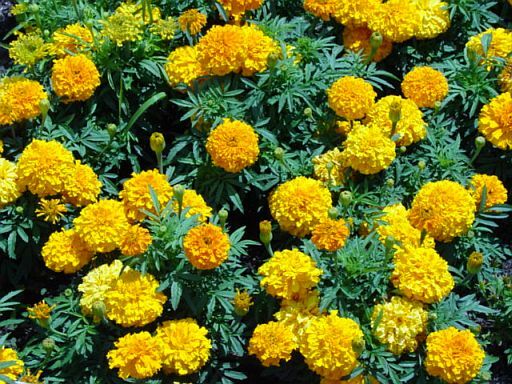 Today, with modern medical science, doctors believe that marigolds have some miracle negligence in it, because marigold tea can work on prevention of AIDS, diabetes, cancer and so on. According to some magazines, farmers plant marigolds together with other plants, because it is effective to repel harmful insects in vegetable gardens. Though, we do not have any definite records yet, why don't you try and see to it by yourself? Medicinal uses such as antibiotic, cancer, cathartic, diuretic, emetic, expectorant, poultice, tonic, and warts are reported by both traditional medical practitioners and modern medical doctors. It is used in treating joint pains, burns, scalds, and as a warts remover with leaf juice. Flowers are used for mucilaginousness, tonic, burns, and scalds. Juices extracted from flowers are effective for snakebites, too. The flowers, and their alcoholic extract, possess marked antibiotic activity against some pathogenic fungi and bacteria. The seed is expectorant and has been used in treating cancer, eczema, etc. The powdered seeds are given to women during labor in order to provide strength. The seed is edible whether you cook it or in raw. A dye is obtained from the flowers and leaves. The prepared juice has been used for dyeing finger and toenails. The seed contains 27% of viscous oil. Most medicinal herbal tea, especially marigold tea has a certain medicinal property which calms the brain wave to normal form and repels the negative energy even in a short period of time. This means that marigold is effective to some viral diseases, too, just like that of PYRO-ENERGEN machine.